Team USA's Aja Evans, a bobsledder, models the heated jacket worn by members of the U.S. Olympic and Paralympic Teams at the opening ceremony of the 2018 Winter Olympic Games in PyeongChang, South Korea. Photo courtesy of Ralph Lauren / Team USA. NEW YORK–The opening ceremony parade uniforms worn by members of the U.S. Olympic and Paralympic Teams athletes at the 2018 Winter Olympics introduced a unique wearable heat concept that is said to seamlessly integrate fashion and the latest in apparel innovation. Ralph Lauren's limited-edition opening ceremony parka and limited-edition closing ceremony bomber jacket included a streamlined heating component, designed with the intent to keep Team USA's athletes warm in PyeongChang's cold temperatures. In a process developed exclusively for Ralph Lauren, the heating system is made from electronic printed conductive inks, printed in the shape of an American flag in carbon and silver ink and bonded to the interior of the jackets. The printed conductive inks are flexible and stretchable, and connect to a battery pack with three settings. They provide wearers of the jackets with immediate heat and 11 hours of heating time at full charge. Polo Ralph Lauren's 2018 Team USA opening ceremony uniform is made in the United States and combines traditional American references refreshed with modern touches and techniques, interpreted in an all-American color palette. The look includes a heated red, white, and blue down parka, a slim jean with moto-inspired seaming, and a patriotic intarsia-knit wool sweater. 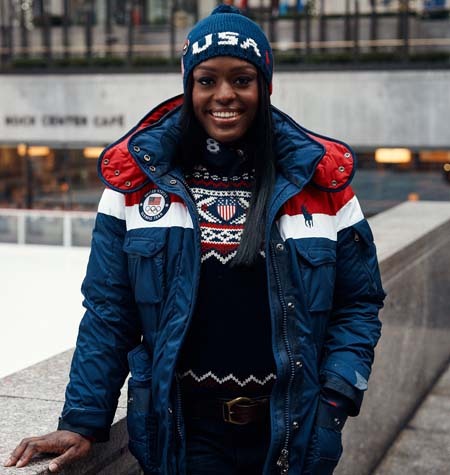 "Ralph Lauren has effortlessly woven style and functionality into the opening ceremony uniform for the 2018 U.S. Olympic and Paralympic Teams," said Lisa Baird, chief marketing officer for the U.S. Olympic Committee, in a press release prior to the Opening Ceremony. "The revolutionary design will keep American athletes warm as they proudly walk through PyeongChang Olympic Stadium during the Opening Ceremony."